A philosophy that is woven in offering an unforgettable experience from the ground up… starting with the perfect area rug that fits your personality and lasts for generations. Established in early 90’s by selecting quality handmade rugs from the vast corners of middle and far east to the weaving centers of Nepal, building a bridge from the passion of eastern artisans and the desire of western interior fashion; a connection that has given us the privilege of being the leading source for area rugs across the Pacific Northwest for the past 20 years; we carry a pride in offering the best quality rug money can buy. From traditional, transition and modern living. With nearly $2,000,000.00 inventory, 1000’s of design and sizes in stock, your visit to our rug department would be As We Promise “an unforgettable experience”. Impact A Life is formed on a simple principal and an optimistic wish to make an impact in the lives of people deprived of a resourceful environment. It is a value shared by the pure heart of selfless individuals that are devoted to providing hope to the underprivileged communities of India, and an encouraging future to the orphaned children of Nepal. With an ongoing effort and the support of bighearted partners, we have been fulfilling some of these basic needs that are so often neglected; education, hygiene classes, housing, food, clothing and health care to name a few. We believe addressing the basic needs of less privileged people may be the first step towards not only self dependence, but also empowering individuals to improve the living conditions of their families, communities and, ultimately, their future generations. Simply by purchasing these rugs you are joining us in this effort; the Impact a Life Foundation will match a portion of your purchase and/or any additional contribution. The Impact Plus Program is a supporter of no child labor and dedicates a percentage of the profit from this site to the Impact a Life Foundation. 100% of the proceeds will go towards our managed projects, thus providing better living conditions in villages and orphans of Nepal and India. Click here to see how you can make an impact. Having been in the business for over twenty years, we have a lot we can say about the wonderful customers and designers we've had the honor of working with. Click here to see what they have to say about us. 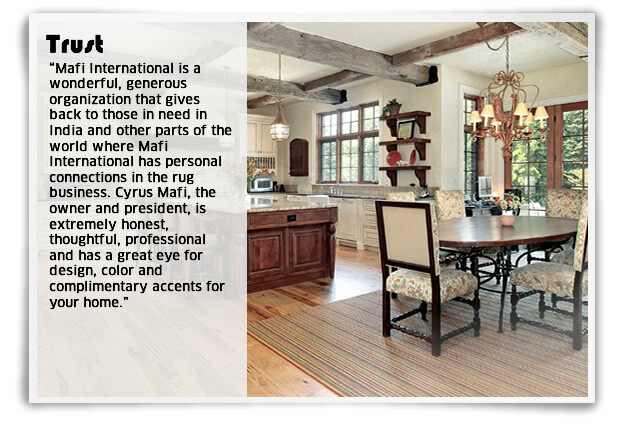 Cyrus Mafi is a third generation aficionado in the luxury rug market. 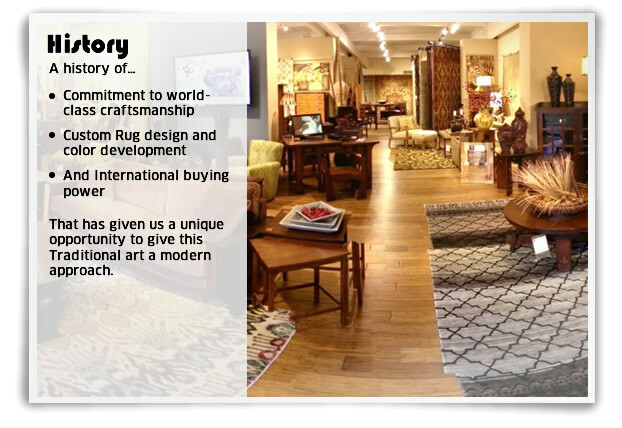 Since 1994, Mafi International has set a benchmark of quality in the modern rug industry. Cyrus’ background in photography, poetry and community outreach takes him to many weaving villages around the world, a life journey that has shaped his unique appreciation for color, style and design integrity present in each rug bearing the seal of Mafi Signature. 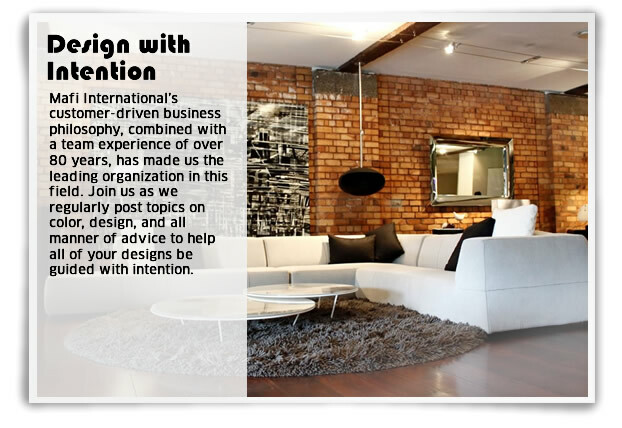 This passion and commitment to excellence is the foundation for all of Mafi International’s endeavors, from design development and customer service to final execution. Our goal is to set you apart from the competition. Our Design Partners use our years of design expertise to help turn any challenge into a work of art. From floor plan to design, color and layout, we are here every step of the way! Click here to start customizing.